I'd been cooped up for a couple weeks and it was definitely time to get out. 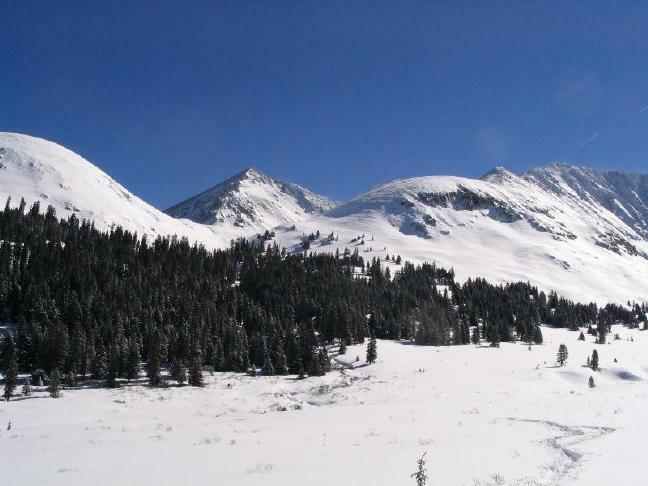 Nathan and I made plans to climb Pacific Peak, a high 13er in the Tenmile Range this weekend. The weather on Saturday called for extensive snow, more extensive wind and brutal temperatures. Sunday looked better with no snow, less wind (though still 20+ mph) and equally cold temperatures (wind-chill around 0). Clearly Sunday was the better option! We set out from the Mayflower Gulch trailhead on CO91 at 8:30 am under nearly cloudless skies. The winds and temperatures were both better than had been forecast though we could see long plumes of snow off the peaks. 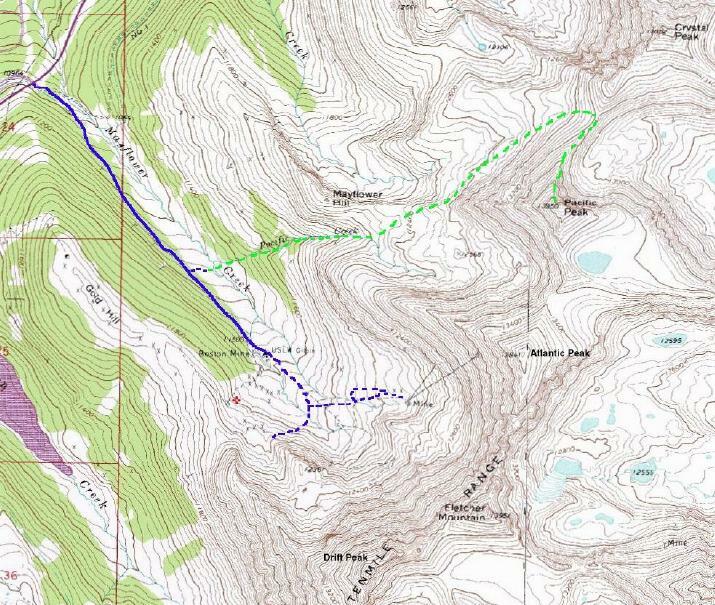 Our plan was to hike about a mile up the road toward the Boston Mine, and then strike out to the northeast across the Mayflower Gulch (a wide valley full of willows and fens) and ascend the Pacific Creek drainage between Mayflower Hill and Atlantic Peak. Next we would skirt the steep northwest face of Pacific and ascend via the sharp north ridge to the 13,950' summit. Looking across the Mayflower Gulch at the awesome Pacific Peak. Our attempt at crossing the gulch can be seen in the foreground. Map of our travels. 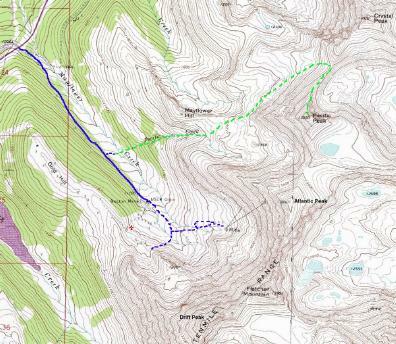 Green is our intended route; blue is our actual route. The first mile was easy walking in a couple inches of new-fallen powder on top of packed trail. We rapidly grew warm from the exertion and were periodically startled by the loud, resonating of avalanche control bombs being fired off up near Copper Mountain. Soon we came to a spot where we could look directly across the Mayflower Gulch and up to the summit. Nathan took one step off the beaten path and was quickly in up to his armpits! He's about my size but was wearing Amy's snowshoes which are designed for someone about 2/3rds his weight. My snowshoes are much larger and I offered to break trail across the flats. Even with my big Sherpas, I was breaking through 2-3' with every third step. My packed trail was helping, but Nathan was still floundering behind me. Compression failures in the snowpack created terrifying WHOOMPH! 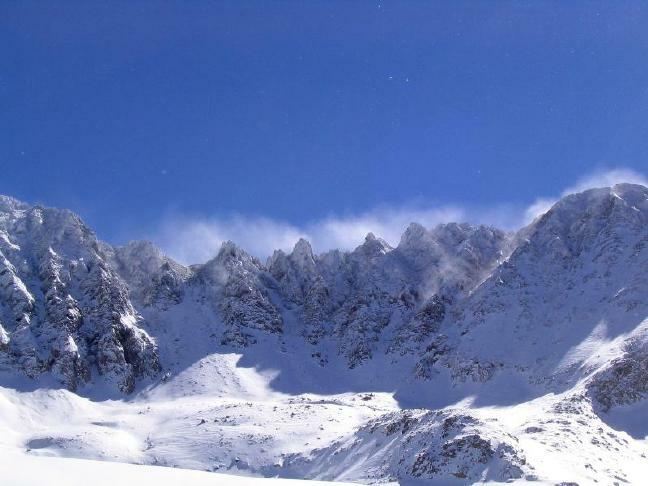 sounds indicitive of weak snow and prime avalanche conditions. 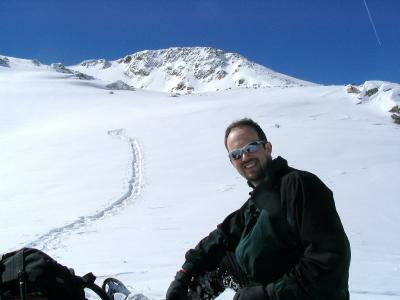 We were on dead-level terrain and avalanches were not an issue right here, but it was still vicerally scary. We had gone maybe a hundred yards and crossed perhaps a quarter of the flats but the trees ahead promissed to be no better. A mile of this stuff?! Clearly climbing Pacific in this kind of conditions was going to take forever and require herculean efforts. We quickly came up with a backup plan and, tails between our legs, turned back to the packed trail. The rugged Fletcher-Atlantic ridge. Nathan thinks this looks like a fun traverse. I think it looks scary. Instead of altitude, we opted for history. We proceeded another half mile up the old road and visitted the remains of the Boston Mine. This area was heavily mined back in the XXXX and many old logging cabins and other works remain. Some of these even poked through the snow! This was also the head of a huge cirque formed by the towering walls of Atlantic Peak on the north and Fletcher/Drift on the south. Nathan in the remains of one of the Boston Mine buildings. The mountains in the background are Atlantic (on the left), Fletcher (middle) and Drift (double-humped shape) with the spectacular ridges in between. We decided to climb the 'small' hill in front of Drift. After a quick first-lunch, we set our sights on a small hill (marked 12361' on the topo) and started for it. I lead the way across the flats working steadily up a shallow grade. The snow was so bright and featureless, I had to squint even through sunglasses. I followed a faint set of ski tracks and found the going better than it had been below, but we would still punch through every dozen steps or so. Heavy going, but not impossible. There were frequent whoomphs which, despite still being on essentially level ground, caused my heart to skip a beat each time. 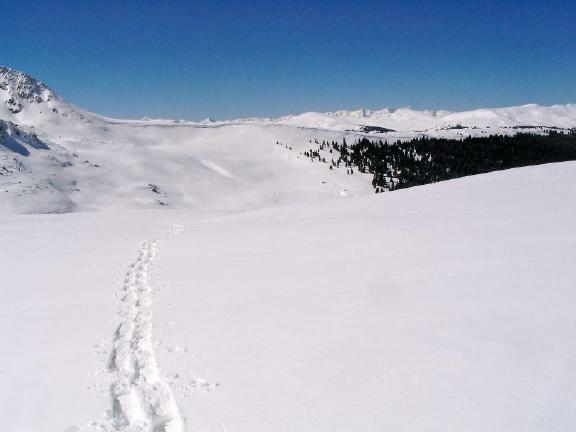 Eventually, we diverged from the faint ski tracks and turned south toward our hill. Turns out this hill was neither as small or as close as it had appeared. From up close, it was very imposing and flanked with steep snowfields and talus slopes. Given the amount of whoomphing going on, we plotted a course around to the west to take advantage of the shallowest slopes. 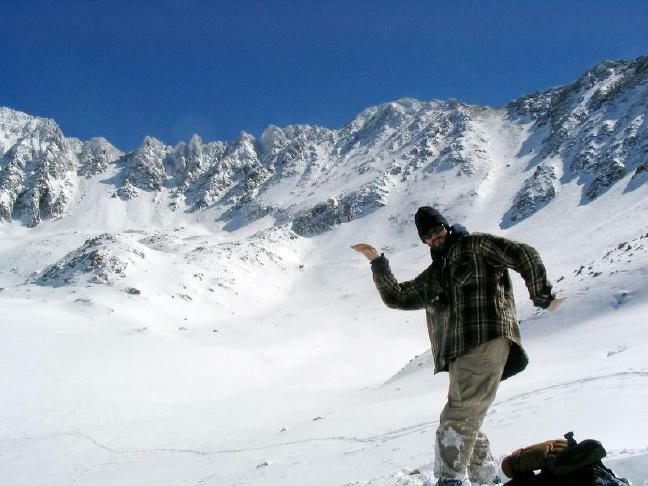 Our path winds laboriously through the Mayflower Cirque. Even these shallow slopes turned out to be steeper than I likes. I made a foray up a short, 15-degree slope to attain a higher plateau, heard a couple of whoomphs, and quickly retreated. We decided that this was far enough and set up for a second-lunch. You couldn't pick a more beautiful spot and everything was silent and solitary. I marvelled at the way distances up here looked a lot shorter than they actually were and that slopes felt much steeper when you were on them than when viewed from afar. Temperatures were hovering around freezing and the wind was calm except for occasional moderate gusts. Yours Truly at second-lunch. The end of the trail is visible behind me. Nathan boogies it up at 2nd lunch. We turned to head back out planning to retrace our route in and minimize the effort needed. Already we'd seen that being the third or fourth person over a route was far easier than being first or second. Still, I couldn't resist the call of the unknown. While Nathan waited and took some photos, I headed north up the slopes to the bowl under Atlantic's south face. We had seen an old mine there with a tramway cable stretching most of the way to Atlantic's summit and I was eager to investigate. Half an hour of heavy slogging left me somewhat less eager, however, as I discovered that the mine building was conciderably farther away than I'd bargained on and up a conciderable grade. I got within a few hundred yards and took some photos. The Atlantic mine and tramway. The cable stretches from the tall building in the foreground up to the shack perched on the sheer side of the mountain. Presumably, ore was mined above and then transported down by cable cars. On the plus side, I'd now risen high enough to see over the cornices on Gold Hill to the southwest. Beyond I could spy the rugged, impressive peaks of the Sawatch(?) range including Mts. Elbert and Massive, the highest in the state. I turned to head back to Nathan and decided to take a slightly different route. Striding down the slope was much easier than climbing up, despite the deep snow and I made good time. I was in the middle of a moderate slope (15 degrees?) when I dropped about half an inch as snow for 50' around me failed in compression. A titanic whoomph sounded and it echoed off the cirque behind me. Yow! I made an abrupt change in course and practically levitated off the snow. Wow that's some primally scary stuff. The Sawatch(?) range seen over the cornices on Gold Hill. I returned to Nathan without incident and we hiked out. Back at the Boston Mine ruins, there were perhaps a dozen people on snowshoes milling about and and equal number of dogs. None had ventured beyond the mine and into the soft terrain. We stopped for an extended third lunch. The trail from here on was now so well packed down that we decided to forego the snowshoes and hoof it. Mostly, I was just tired of wearing the damn things on my feet. We zipped out 1.6 miles to the car in the warm afternoon arriving at 2pm. Not exactly what we'd planned, but a nice and strenuous trip none-the-less. It was exciting to see a new mountain range and we will be sure to return when the snow is better consolidated to make a second attempt.